Microsoft Office Basic Edition 2003 is designed for customers with limited document authoring, analysis, and communication needs. For one-computer. For Windows 2000 to XP only. 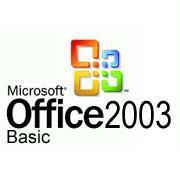 Includes Office 2003 Basic OEM Includes, Word, Excel and Outlook 2003 . Vis dar turime sandėlyje, kiekis ribotas. Office 2003 Basic OEM Edition can help organizations and their employees transform information into impact. Office 2003 Basic OEM includes new and familiar products, features, and functionality improve how people and organizations connect to people, information, and business processes. Office 2003 Basic OEM advances intranet collaboration through integration with the collaboration and information-sharing portal, Microsoft Office SharePoint Portal Server 2003, enable employees to access and share information both internally and externally. Support for information rights management (IRM) and industry-standard Extensible Markup Language (XML) provide a platform on which to quickly build cost-effective solutions that can have an immediate impact. Office 2003 Basic OEM helps Streamline communication and collaboration between internal and external team members by using the desktop productivity programs that many people rely on every day. Office 2003 Basic OEM enablea teams to modify, access, and save documents in a central location by using Document Workspaces. In addition, the Shared Workspace task pane displays tasks, related documents, links, and member lists that notify you when your team members are online. Document Workspaces and the Shared Workspace task pane require Microsoft Windows Server 2003 running Microsoft Windows SharePoint Services. Share documents with team members for modifications and have control over what gets changed. You can choose permission settings and allow coauthors to alter only the sections or formatting that you choose. Office 2003 Basic OEM improves the efficiency of your meetings with Meeting Workspaces, which offer a centralized location for sharing agendas, visual resources, and other documentation. Meeting Workspaces require Windows Server 2003 running Windows SharePoint Services. Contact team members quickly with instant messaging (IM), which can be displayed in most programs in Office 2003 Editions and lets you know when your team members are online. Online presence information requires Windows Server 2003 running Windows SharePoint Services. Schedule meeting times quickly with team members. When you use the personal information manager and communication program, Microsoft Office Outlook 2003, with Windows SharePoint Services, you can compare schedules side by side or view team calendars. Office 2003 Basic OEM - Manage, prioritize, and act on an ever-increasing volume of business information. Read e-mail more quickly. The Outlook 2003 Reading Pane displays twice as much content as previous versions of Outlook, reducing the amount you need to scroll to read e-mail messages. Prioritize e-mail messages by using Quick Flags to indicate a priority or time-sensitive messages. Save time spent rereading e-mail messages in threaded conversations. You can group all messages by subject line and then quickly scan or delete entire conversation threads. Find important e-mail messages immediately. Use Search Folders to save commonly used searches and then use them when you need them. Store the resulting messages in any folder, and still access them quickly. Search folders require a connection to Microsoft Exchange 2003. Help block junk e-mail messages from cluttering your Inbox with the new Junk E-Mail Filter in Outlook 2003. Use Outlook 2003 in different network environments. Outlook stays connected to a network even when you roam between different connections. Help protect your privacy. With Outlook, you can choose when to include Hypertext Markup Language (HTML) content in an e-mail message, and can help prevent unsolicited attachments from automatically returning information to the originating server. Keep working regardless of your connection status. If your network connection is unreliable, the Cached Exchange Mode in Outlook 2003 saves and displays the information from the last time you connected to the network. Caching requires Exchange Server 2003. Access resources while working on a files. The new Research task pane can help you access electronic dictionaries, thesauruses, online research sites, and proprietary company information while working in Office 2003 Basic programs. You can find information and incorporate it into your work quickly and easily. Take notes directly in your files. If you use a Tablet PC, you can use the tablet pen to add comments.